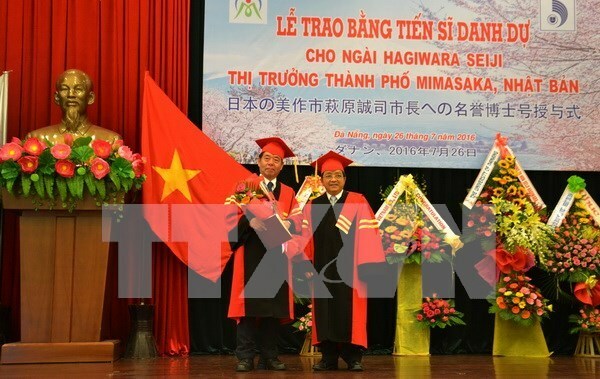 Da Nang (VNA) – Hagiwara Seiji, Mayor of Mimasaka city of Japan’s Okayama prefecture, on July 26, was awarded with an Honourary Doctorate Degree from Da Nang University, for his contributions to promoting links between the Japanese city and the university. In recent times, Mahaska city has promoted multifaceted cooperation with Vietnam, especially in education and training, labour, tourism and economics. The Japanese city and Da Nang University signed an education cooperation agreement in April last year. Hagiwara Seiji said that he will continue working to nurture the traditional friendship and links between the university and Mimasaka, contributing to enhancing ties between Okayama prefecture and Da Nang, and the relations between Vietnam and Japan. Mimasaka’s city authority plans to support students graduating from Da Nang University’s nursing faculty to pursue study of the Japanese language in a college of nursing in the city.